Escaping winter. | And eating good food. Every single day. And eating good food. Every single day. After our five days in Ipoh we drove down to KL. In the two hours it took to drive the landscape changed from hilly and green to flattish and green. As we were heading for Lombok we wanted to drop some of our luggage and fly with as little as possible. The Royale Chulan once again showed that they are truly a service minded hotel. We had rooms booked after our trip to Lombok and we were told we could leave our bags there, without a fee or anything. A hotel worth every single one of its 5 stars. So after the luggage drop we drove to KLIA2, the airport outside KL where the less expensive flights leave from. It is a huge place and much nicer than many of the airports I have travelled from or to. 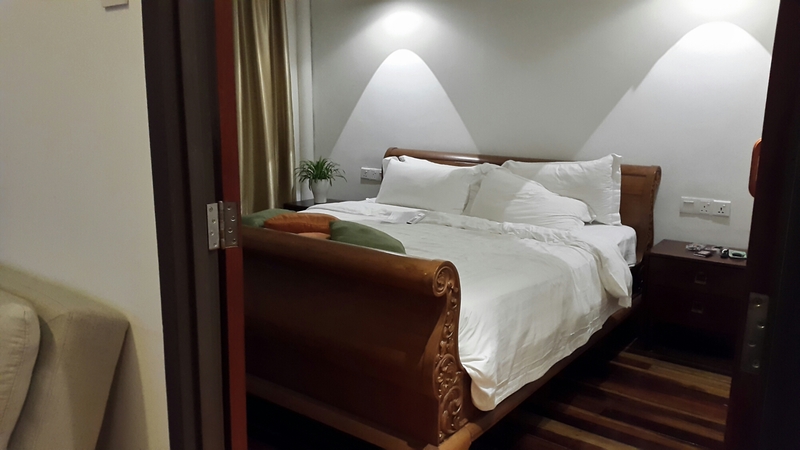 Our flight to Lombok left early on Friday morning so we spent one night at the Tune Hotel, about 10 minutes walk from the terminal. 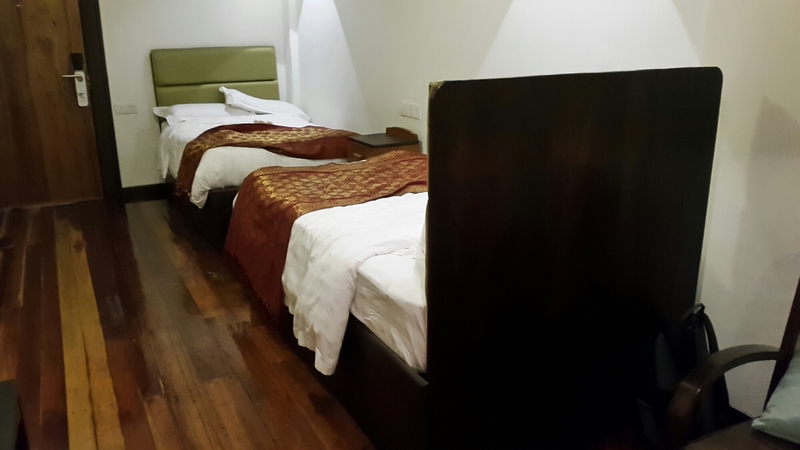 The Tune Hotel is like most airport hotels- too expensive and not that clean or special in any way. The staff at the reception was really helpful and sweet though as was the guy working at 7 11. The best thing about the airport hotels is that you wake up at the airport and don’t have to worry about taxis or traffic. We got at least two more hours of sleep this way which was good but we still had to get up at 5.30. Not my cup of tea at all…. The flight to Lombok went smoothly but there were some turbulence which I really hate. I get dizzy and nauseous as does my oldest daughter. My youngest tend to fall asleep or laugh her way through turbulence. Getting a taxi at the airport was easy and we drive off less than an hour after landning. The roads on Lombok are fine but a bit narrow and winding, especially in the northern part of the island. That is also where the mountain area is and the big (still active) vulcano. 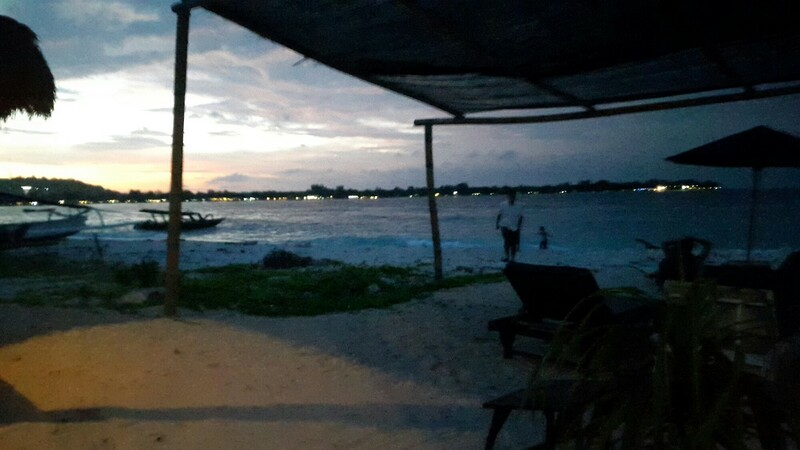 We took a speedboat to Gili Meno, a small island close to Lombok, and at about 4pm we checked in to our hotel. We had booked two small bungalows at Sunset Beach Bungalow and after a quick change into swimsuits we jumped in to the ocean. Excellent way to spend an afternoon! After dinner we sat and watched the sun go down and only went to bed when the mosquitos forced us to. After a late breakfast we decided to take a look at one of the temples located close to Ipoh. We drove about 20 minutes to Kek Look Tong (or Kek Lok Tong or Kek Lock Tong, as usual in Malaysia you get several spelling options). It is a Buddhist temple located inside a cave and as you walk into it there are several small rooms to visit. There is also a garden sorrounded by the mountain and it is really peaceful and quiet. The school holiday had ended on the day of our visit so it was not crowded at all. We could walk around and take our time which was really nice. The whole family enjoyed it. Near the entrance/exit there are signs telling the visitors not to feed the monkeys. As we exited the cave we saw people feeding the birds and of course the more courageous monkeys where quick to grab the food. They were macaques and that is not the type of monkey you want to feed. They tend to get very cheeky and agressive once they become used to the easy access to food. After our close encounter with aggressive macaques on Langkawi I am not overly fond of that particular breed of monkey. I do wish people would make sure not to feed them as the result more often than not is that the monkeys are shot. As they become so aggressive they are a danger to people so please, no matter how cute they are do not give food to a macaque. It rarely ends happily. The children were tired in the evening so my mother volunteered as babysitter and my husband and I went for a walk. Ipoh is the fourth (or fifth depending on which source you’re using) largest city in Malaysia but it is not that busy in the evening. The areas we walked through were nice and quiet and lots of shops and restaurants were open but closed around 10pm. There is a night market just of Jalan Iskandar called Tingkat Pasar that opens at 8pm and closes around 2am every day of the week. Not much food on sale but lots of mobile phone acessories and other trinkets you might not know you need. We ended up buying some popiah and ice coffee at a hawker place and slowly walking back to the hotel. Driving in Malaysia is not for the faint hearted or the driver that insists on following every rule in the book. I have mentioned it before and I most likely will again but Malaysian drivers are not that keen on sticking to the rules. Every lane is a fast, slow, turn, double park lane- it all depends on the driver. So the only advise I can give you is to go with the flow, follow the pace on the road and BREATHE. Our trip from Melaka to Ipoh went smoothly and took about 5 hours with lunchbreak and all. No heavy rain and a clear sky meant that we got to see the mountains as we approached Ipoh. It is such a beautiful landscape around that city, no photos can truly capture it. 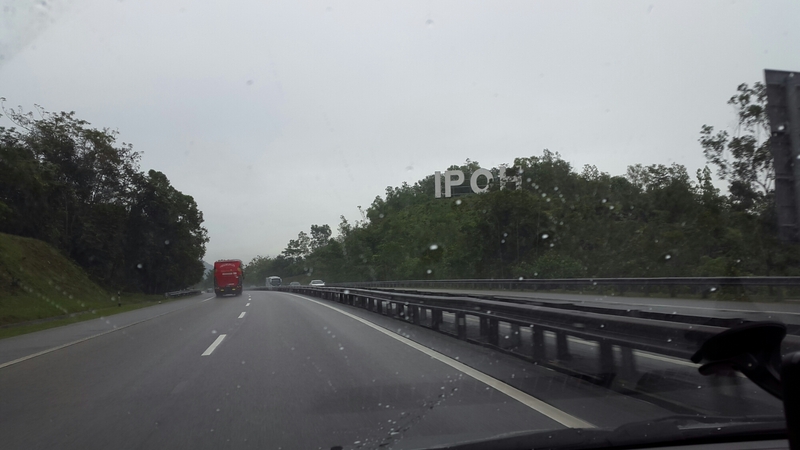 The Ipoh sign pictured below is in reality huge. On YouTube you can find videos of people climbing it and it is so tall. 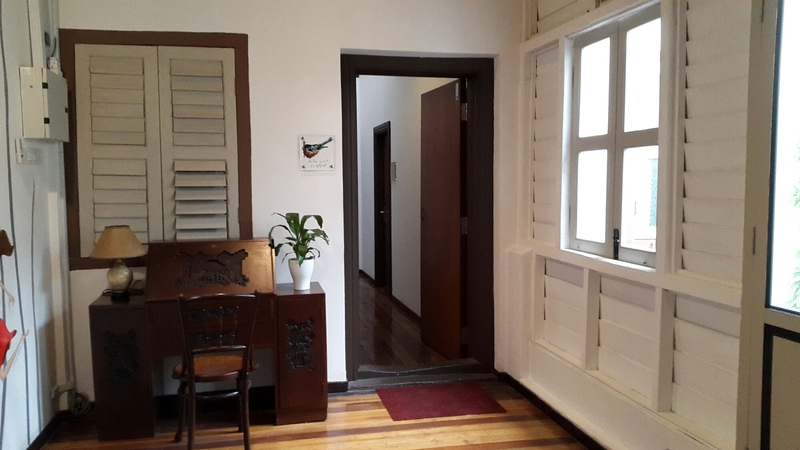 We had decided to stay five nights in Ipoh and after some research I booked us at the Sarang Paloh hotel in the Old Town of Ipoh. The hotel was amazing, the staff ever so helpful and the rooms were both beautiful and clean. Every day two guys spent over an hour and a half cleaning our room and to be honest it was cleaner than our apartment back home. The only drawback was the traffic outside our room but we had been informed about that when we booked so it came as no suprise. My husband, two children and I had a family room that was really two rooms and a bathroom (with both a shower and a bathtub!). Loved it. My mother and mother in law shared a room and as it was overlooking the garden it was a lot more quiet than ours. The corridor leading up to our room. 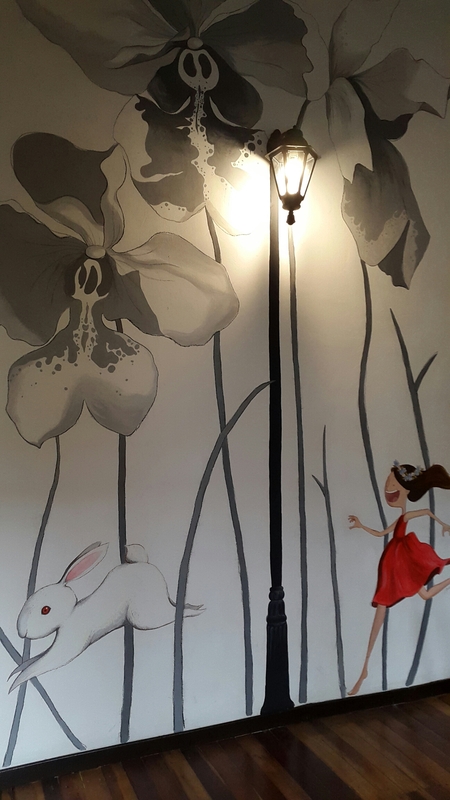 It had a lovely mural on one wall. Our room wasn’t cheap but I can truly recommend the place. They don’t serve breakfast but there is a great little place right next door where you can get a nice breakfast and lunch as well. As a hotel guest you get a 20% discount so don’t forget to mention where you are staying. I loved Old Town and it was perfect for us to stay right smack in the middle of it. We parked the car at the free indoor parking space provided by the hotel and then we walked everywhere. Ipoh might be a big city but it sure felt like a small town when we went out at night. The drive from T6 to Melaka went smoothly but we ended up driving to the wrong place after following the gps’ directions. Apparently there are more than one Jalan Masjid in the city… So after making a u -turn and checking the gps a bit more closely we ended up at Hotel Hong, about 5 minutes walk from Jonker Street and smack in the middle of the old part of Melaka. Excellent location, free parking, friendly staff and very clean. Only drawback was the lack of a fridge and an elevator. Heavy luggage does not get any lighter when there are only stairs to get your room. Once again we have overpacked, strange how we never seem to learn. The children wanted to revisit the Oceanarium at The Shore and we all enjoyed it. 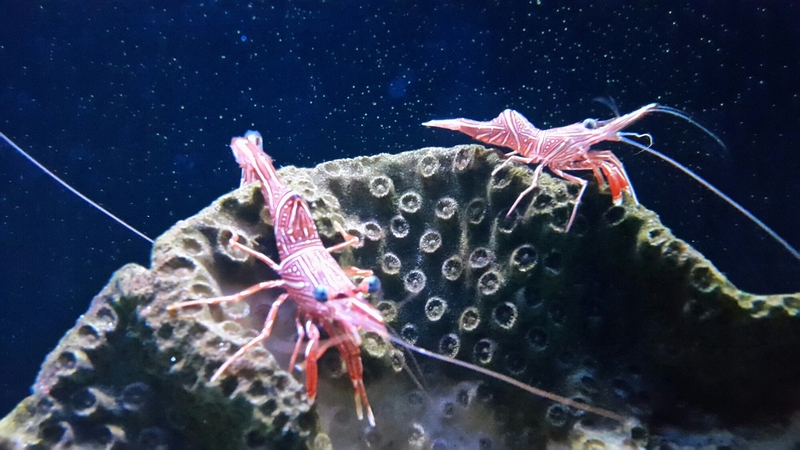 I found these shrimps that were colourful and looked funny. Camel shrimps, a fitting name when you look at their backsides. 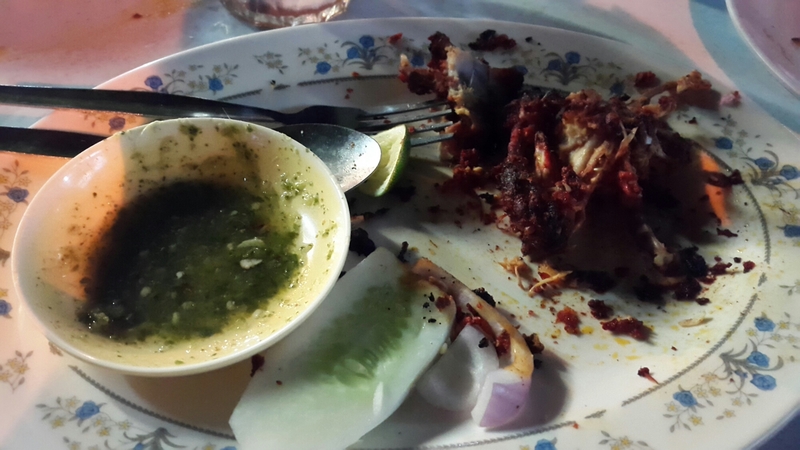 My husband and I left the children with my mother one evening and went to the Pak Putra restaurant. They are well known for their tandoori chicken and I understand why. It was delicious! We enjoyed our three days in Melaka but felt that it is not really our kind of place. The inner city is so crowded and getting more and more touristy, but it is still worth a visit. Three days were enough for us as it was our second visit. The market on Jonker Street was as usual packed and busy and after an hour I was exhausted. My mother was overwhelmed and when she realised the market is EVERY Friday and Saturday she just shook her head. We packed up and headed north to Ipoh. Two weeks have flown by and we have been busy. First three days in Singapore, then three days in JB and then onwards to the house in T6. We have been to Desaru on a day trip, gone swimming at Diamond Hill, been to two Pasar Malam and more. On Christmas Day we went to Segamat to attend my husband’s second cousin’s wedding. 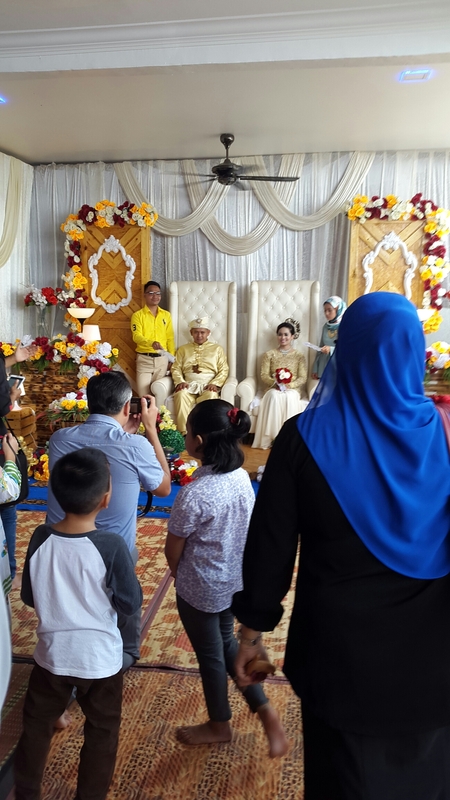 It was truly interesting to take part in a Malay wedding and I am so happy that they invited us. 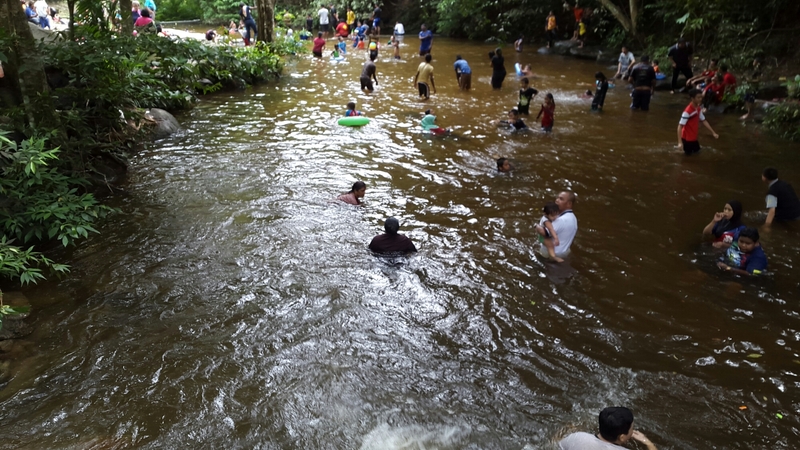 The day after the wedding we went to the waterfalls at Gunung Ledang, not too far from Segamat. The water was cool and the children enjoyed it immensely. Us grown ups did too. 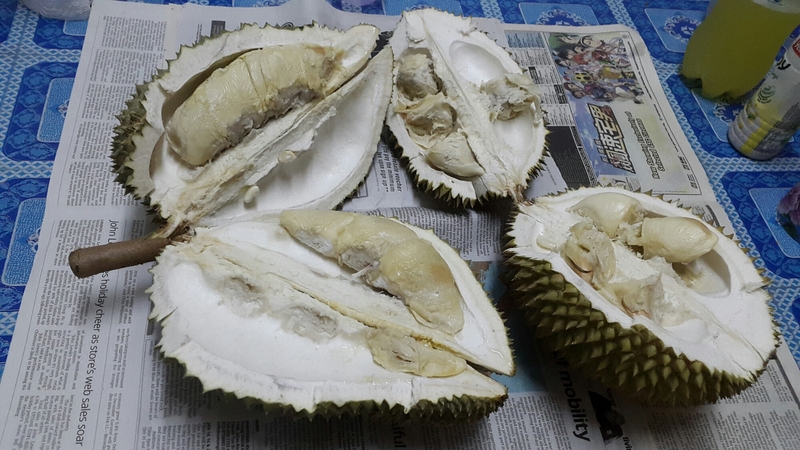 After a couple of hours in the cool waterfalls we drove home and about ten minutes from the house in T6 we noticed a small truck by the roadside that sold durian. 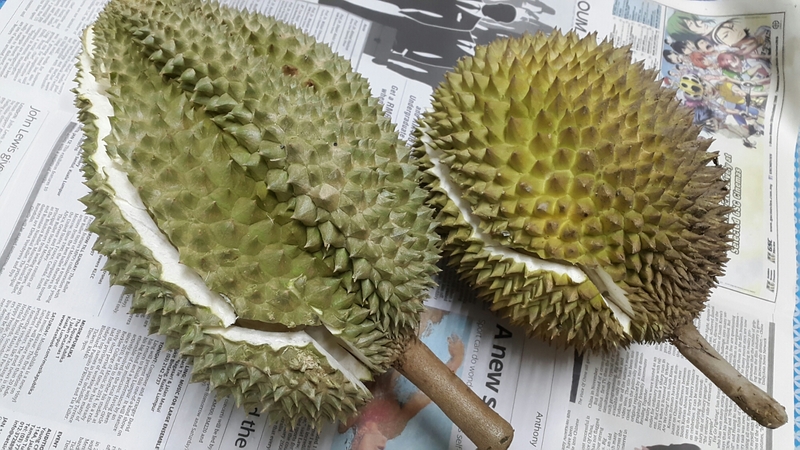 Durian is the smelly fruit which you either love or hate. When I first tried it I must admit I wasn’t too keen but now I love it. It does smell like something you really shouldn’t eat but it tastes so good. Tomorrow we will leave T6 and drive to Malaka. Or Melaka, Malacca or however you choose to spell it. So we are in Malaysia now, landed in Singapore late on the 13th and then we crossed the border on the 16th. Right now we are at the house in Taman Sri Lambak, our second home as we call it. I have really slow internet so the posts about Singapore and Johor Bahru will have to wait. 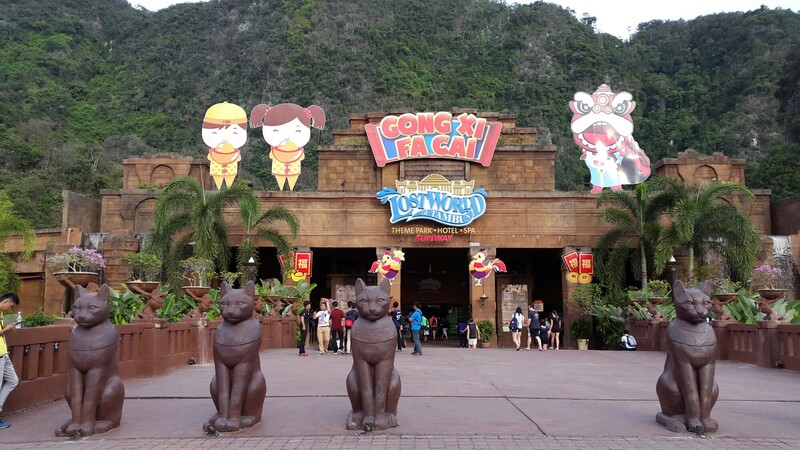 I have loads of pictures from Gardens by the Bay and Legoland plus some other places we have visited. Be patient and as soon as possible I will upload them. The plan for tomorrow is a drive to Desaru for some ocean time. Then on the 25th we are invited to a wedding in Segamat. I am beyond excited!!! 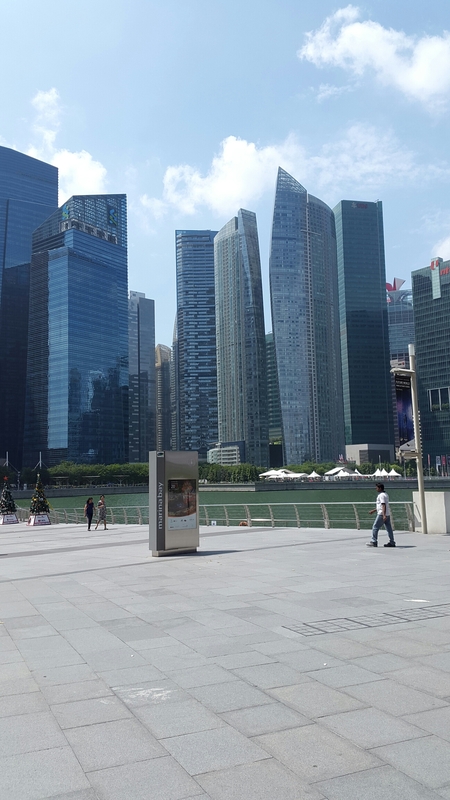 They do have some cool buildings in Singapore. I watched a video on YouTube about the city and a guy said “it’s like I’ve arrived in the future”. It is very modern but not soulless in any way.